A large comfy glider is essential for a new mom of twins. Between feeding two babies and trying to get them to sleep, you'll be spending a lot of time here. It's best if you find one that's big enough for you and both babies so that you can feed them both at the same time. You may also want to invest in a second chair for Dad. See our nursery glider page for more tips on how to choose the best nursery glider for you and your baby. Speaking of tandem feeding, you'll never get this right without a nursing pillow large enough to accommodate two feeding babies. Fit around you so that the feeding pillow stays put even if your babies wriggle. What we don't like: Nothing - it's perfect for twin tandem feeding! Getting out of the house with one baby and all that baby stuff is challenging enough. Add a second baby and a simple trip to the mall takes on the proportions of a North Pole expedition. 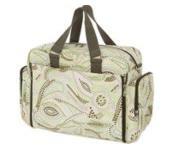 One thing you can do to make your excursions with baby easier is to stick to carrying one diaper bag rather than two. Believe me, carrying more than one diaper bag is never a good idea. Keys get lost, things get left behind - it's just too complicated! 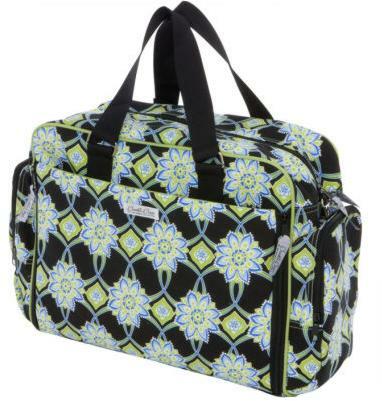 There are plenty of gorgeous diaper bags on the market to choose from, but remember, when it comes to choosing a diaper bag for twin baby gear you are looking for space, space, space above all else! You'll have twice as many bottles, diapers, toys, snacks and emergency outfits to fit into your bag, so look for one with enough pockets, compartments and insulated bottle warming pouches. In my extensive diaper bag experience of the past ten years I have found that it is far more practical to have a big, but well-organized baby bag rather than a smaller bag that's stuffed to the brim so that you can't find what you need when you need it. You know when your babies start screaming for food they mean now - not in ten minutes when you finally manage to locate a spoon! 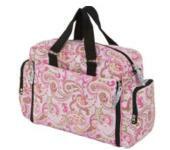 I've found that travel or overnight diaper bags work best when you have a lot of baby stuff to carry. They tend to have the extra pockets you will be looking for, as well as, the extra space. Csnbaby.com has a great selection at reasonable prices. 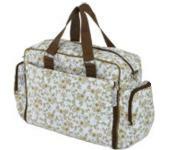 See my best diaper bag article for more tips to help you with choosing a roomy bag for your twins' baby stuff. Still on the subject of escaping the home every now and again, strollers for twins are an absolute twin baby gear must-have! - No question! Baby gear and nursery decor bargains, sales, clearances and special offers. Do you have favorite absolute must-have twin gear items that you couldn't do without? 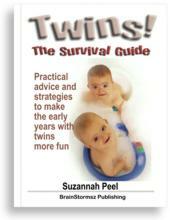 Let us know and write a review of your favorite twin baby gear. You'll receive a free ebook!